63"Long heavy duty Z rack with optional bottom shelf. Height adjusts from 66" up to 80''H. Weight capacity 300-400+ lbs. Rolls easily on 4'' industrial casters with brakes. 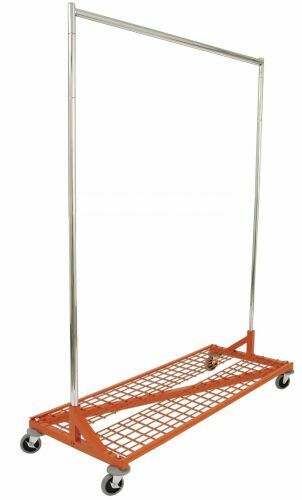 Uprights and hang bar are chrome finish, base is painted OSHA ''safety-orange''. Racks can nest together for easy storage when not in use. Color: chrome with orange base, orange bottom shelf.